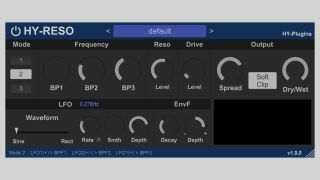 Having already given you multiband drive and combined chorus/flanger plugins in 2016, HY-Plugins' year of generosity continues with the launch of HY-Reso, a free filter effect for Windows. This comprises offers three parallel-chained band-pass filters, while modulation options include an LFO and envelope follower. You get a free presets to try, and there's also a randomise option. Download HY-Reso now from the HY-Plugins website. It's available in VST format for Windows.